High-end multi-focal contact lenses for up to 30 days continuous wear. Since their release in 2006, PureVision Multi-Focal has quickly become one of the most popular multi-focal lens brands worldwide. Multi-focal contact lenses can replace varifocal glasses, or long distance and reading glasses in cases of presbyopia connected to short- or far-sightedness. The specially engineered material of the PureVision Multi-Focal originated in the PureVision Spheric lens. You can wear PureVision Multi-Focal lenses, with the consent of your eye doctor or optician, for up to 30 days and 29 nights continuously. This is made possible by the introduction of the specially developed silicone-hydrogel balafilcon A. This material maximises the replacement of tear fluid, so that the eye is always supplied with sufficient oxygen. The low water content reduces drying out of the eyes and enables effortless wearing of PureVision Multi-Focal contact lenses without irritation or dry eyes. The low maintenance required for PureVision Multi-Focal lenses is liberating for the wearer. The design of PureVision Multi-Focals reduces lack of focus and distortion in the field of vision. The ability to wear the lenses day and night, will spare you the daily bother of inserting and removing lenses and free you from cleaning and care problems. Discover the great savings on offer when you order multiple packs of PureVision Multifocal contact lenses in the Mister Spex online store. Mister Spex advises all online purchasers of PureVision Multi-focal contact lenses: the contact lenses, PureVision Multi-focal, should always be fitted to your eyes by an eye doctor or optician. The period between fittings, unless otherwise prescribed by an eye doctor or optician, should not exceed 6 months. You should go for regular check-ups. 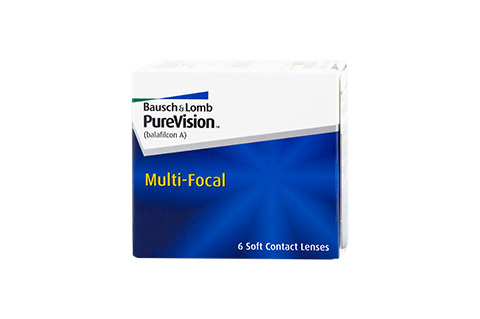 The manufacturer Bausch & Lomb/your eye doctor/optician's recommended wearing time for PureVision Multi-focal contact lenses should be followed strictly. It is your own personal responsibility to make yourself aware of the care instructions for PureVision Multi-focal contact lenses and to follow them accordingly. In case of eye irritation or visual impairments caused by PureVision Multi-focal, remove the contact lenses immediatere to comply with these safety precautions can caucontact lenses should be replaced immediately.